Last week I pointed out that the easiest way for Google to improve search would be to allow one query to bring up separated results by regular sites, blogs, news, photos, and/or video. I mentioned that the big three for me would be regular search results, blog posts, and news. I’d be able to get pertinent, organized results in one third the time. Why not put in my search query once and get the top 10 results from each category on the same page? 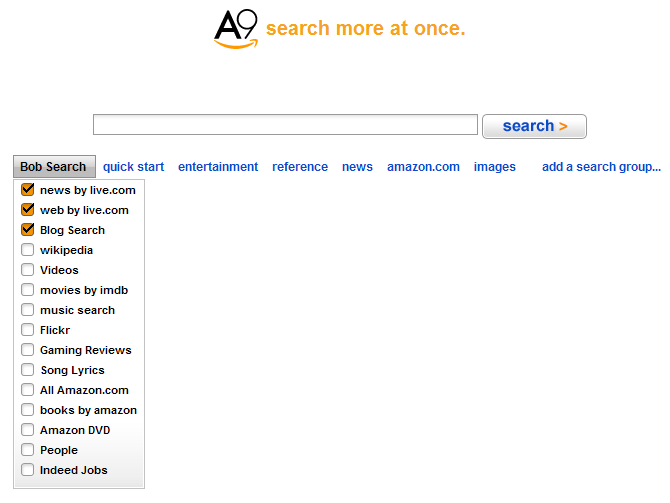 SearchMash almost does what I want, separating out images, blogs, videos, and Wikipedia from the regular search results. But I have to click on the little plus next to each of these categories one at a time for the results to populate for me to actually see anything beyond the standard search results (click on picture above to enlarge). Also, these are the only predefined categories; currently no customization is available. I must say that A9 is very impressive. The default page is a Google-like single search bar but with predefined search groups below. The default search is “quick start” and is set to give you results separated categorically into the web (regular results), books by Amazon , news, and Wikipedia results. The beauty is that it is fully customizable. I was able to quickly create my own search group (see picture above, click to enlarge), which I set as my default to give me results from the web, news, and blogs (finally!). But it also lets me easily add other search sources. So even though my default is the three categories above, I can add or subtract any number of categories for my search (my favorites are shown in the screenshots: movies, music, gaming reviews, etc.). And once I click search, I get the results separated into re-sizable columns (see picture below). In fact, practically everything on the site can be rearranged, enlarged, shrunk, drag and dropped, etc. So my search sources are organized exactly how I want them as is the column order and width of my search results. And at any time after a search, I can quickly add, reshape, change, and scroll through results. Another nifty feature is the “site info” button shown with every search result. I can simply hover over it with my mouse and get a pop window with info on the site in question (such as Alexa rating, how long it’s been online, etc.) before I visit it. It should be noted that A9 uses a combination of search technologies to produce results. For news and web results, Live.com (Microsoft) is used whereas for blog results, IceRocket is used. And other search sources at A9 may use other engines, etc. But so far, the results I have seen compare fairly well to Google results, though I haven’t compared them meticulously. Conclusion: Though I consider myself a fan of Google search, my customized A9 search has now been added as one of my Firefox homepage tabs. For any search where I’m interested in seeing results organized into categories, move over Google, I’m using A9. Next: The Rise (or Fall?) of In-Text Advertising: Is It News…or Is It an Ad?